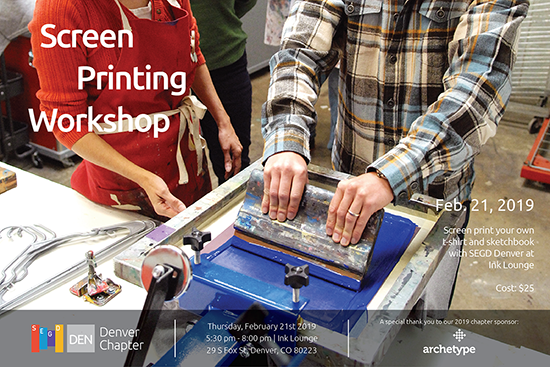 SEGD Denver hosted a hands-on screen printing workshop at Ink Lounge last Thursday night to put the experience into EGD. Our friends Stu and Nikki provided an evening of printing and learning and taught us about the world of serigraphy or screen printing, a technique many designers have encountered in both environmental and print design projects. 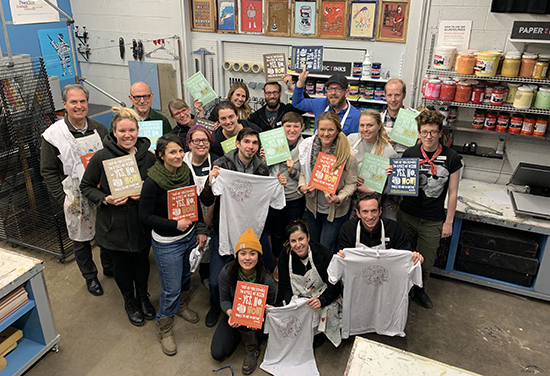 Each of the 25 participants printed their own custom sketchbooks featuring a quote by Milton Glaser with original artwork provided by Denver co-chair Amanda Hurley's staff at Ad Light Group. Additionally, everyone had the opportunity to print custom t-shirts featuring famous Denver icons with original artwork by Denver co-chair Zach Kotel. 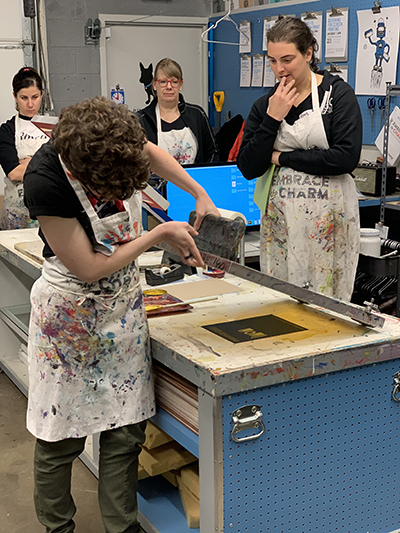 Everybody had a blast learning about screen printing, pulling prints and customizing their sketchbooks for what turned out to be a wonderful makers' night. Thanks to our partnership with Archetype, we were able to print some additional t-shirts for raffle prizes and giveaways at future events. Stay tuned for our next event, coming this spring. 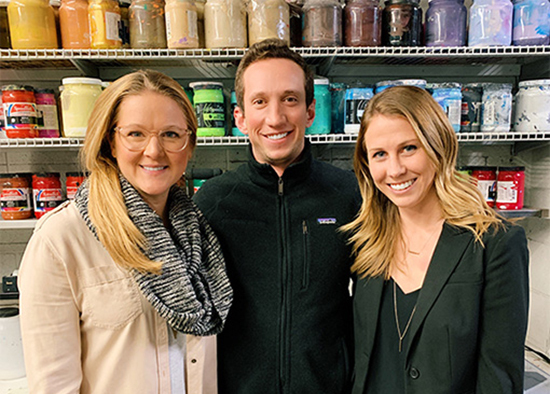 SEGD Denver has welcomed 3 new co-chairs to the chapter in the last year and we are excited to work together to bring new value, members, events, speakers, tours and programming to the Denver EGD community. Zach is the Associate Design Director at ArtHouse Design and has been with the firm for over 5 years, leading project teams in art direction, design and project management, having won multiple distinctions for his award-winning identities and branded environments. Zach designs through a different lens to define style, provoke thought and solve problems in unique, inventive ways. Zach brings a holistic vision to designing and managing huge, multi-faceted projects that are impactful on a local, national and global scale. As a chapter co-chair Zach hopes to increase the profile of SEGD in the Denver design community and bring fresh, engaging and valuable events to the Colorado design scene. Amanda has been with Ad Light Group since 2013 taking on many roles in the firm including project management, finance, business development, marketing and sales; diverse opportunities that have allowed her to learn a great deal about the sign industry very quickly. Additionally, Amanda is a partial owner of Ad Light Group, the family business for over 22 years. 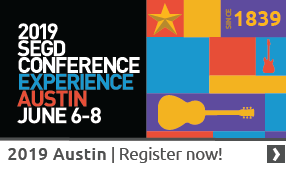 Amanda is a leader in shaping the cultural and strategic direction of Ad Light and has built relationships with suppliers, architects, designers, contractors, developers and others in the sign industry. Amanda brings this breadth of experience and expertise to her role as a chapter co-chair and is excited to help SEGD Denver grow. Amanda is currently an Experiential Graphic Designer at IA Interior Architects, the first global architectural firm focused exclusively on interiors, where she helps organizations communicate within their workplaces to convey their messages, share their story, and engage their visitors and employees. Prior to joining IA, Amanda practiced both Landscape and Interior Architecture at VOA Associates (now Stantec) in Chicago, before transitioning to EGD and working with the talented team at Forcade Associates in Evanston, IL. Amanda is new to Denver, having transitioned from IA Chicago a year ago, and is excited for the opportunity to become a co-chair and increase engagement and awareness for SEGD in the local community. 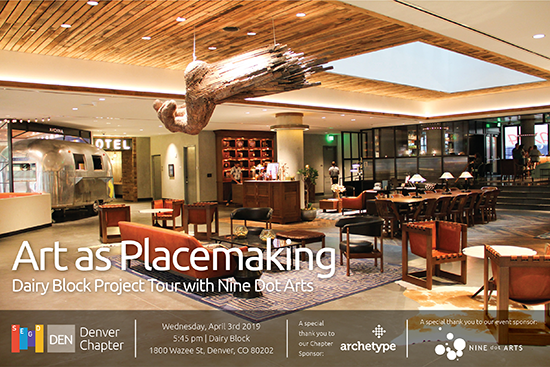 We are thrilled to announce that for the first time in SEGD Denver's chapter history, national specialty fabricator Archetype will be the first Annual Chapter Sponsor, supporting SEGD Denver's events and education efforts so that we can bring better, more varied programming to the Denver SEGD community. 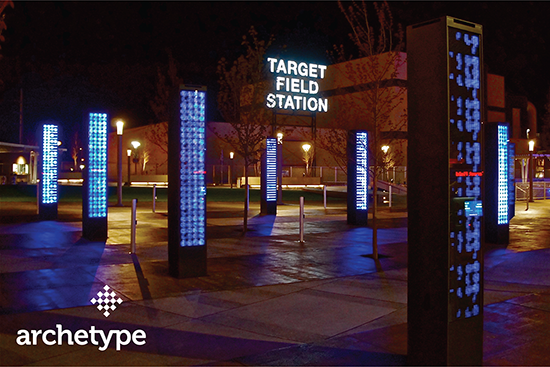 Archetype is a leading custom sign-fabrication partner in the Environmental/Experiential Graphic Design industry committed to turning their clients’ design visions into reality. Their leadership averages more than 20 years in the industry, each valuing collaboration and attention to detail. Archetype prides themselves on creating fabrications characterized by precision, beauty and longevity. Bob Harlow represents Archetype in North America from their recently established office in Denver. Archetype’s capabilities include consultation, project management, precision drawing, production and installation for projects of any size. They have been responsible for high profile projects such as Target Field by Populous, Caribou Coffee by Colle and McVoy, Hennepin County Medical Center, Boston Scientific Corporate Headquarters by Gamble Design and the Science Center of Iowa. Archetype has executed projects in the Healthcare, Entertainment, Institutional, Corporate and Retail.